A year and a half after accepting the first prototypes, the US Marine Corps has awarded BAE Systems and its partner Iveco Defence Vehicles a US$198 million contract to deliver the first 30 of the Corps’ next-generation Amphibious Combat Vehicles (ACV). The contact for the fully amphibious, ship-launchable troop carrier includes an option of up to $1.2 billion for a total of 204 vehicles. The primary mission of the US Marines is to act as the infantry arm of the US Navy, so an amphibious capability is essential to carrying out its mission. The ACV 1.1 program’s job is to provide the Marines with a high-speed armored vehicle that’s self-deploying and can operate in the open ocean, yet can also fight on land alongside an M1A1 Abrams front-line battle tank. 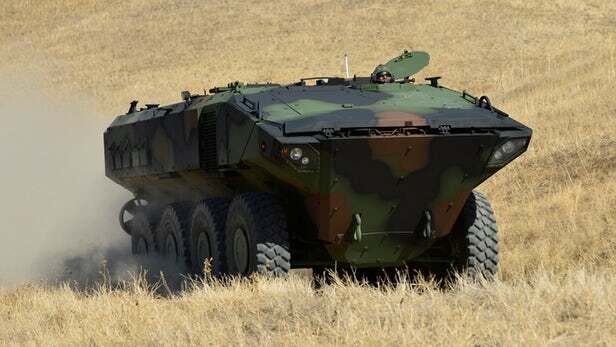 The BAE Systems ACV is built to carry 13 Marines inside a blast-resistant hull designed to take on mines, IEDs, kinetic energy rounds, and overhead blasts as they ride in a suspended interior seat structure. Meanwhile, the crew of three have their own blast protection and there is a fire suppression system. The 8×8 vehicle is powered by a six-cylinder engine belting out 700 bhp (522 kW). Though it weighs 67,500 lb (30,617 kg), it can carry a payload of 7,280 lb (3,302 kg) at over 65 mph (105 km/h) on paved roads and at sea can manage 6 knots (7 mph, 11 km/h). Its range is up to 325 mi (523 km) at 55 mph (89 km/h) on land, or for land and sea missions it can travel 12 nm (13 mi, 22 km) at sea, then travel over 250 mi (402 km) once ashore. BAE Systems says that before it delivered its first 16 prototypes for 15 months of Developmental Testing and Operational Assessment testing, it had already carried out its own in-house risk mitigation testing and evaluation for land mobility, survivability, and swim capabilities. Construction of the ACVs will be performed at BAE’s plants in Aiken, South Carolina; Sterling Heights, Michigan; Minneapolis, Minnesota; Stafford, Texas; San Jose, California; and York, Pennsylvania.